Squeezing pimples that are under the skin may not result in expelling the matter inside. Pimples under the skin that have not yet come to a head can rupture beneath the skin when squeezed, inflaming and infecting the cells under the skin. This can result in a much larger, painful pimple. Most of us think that constant picking of blackheads and pimples will help clear the breakout. 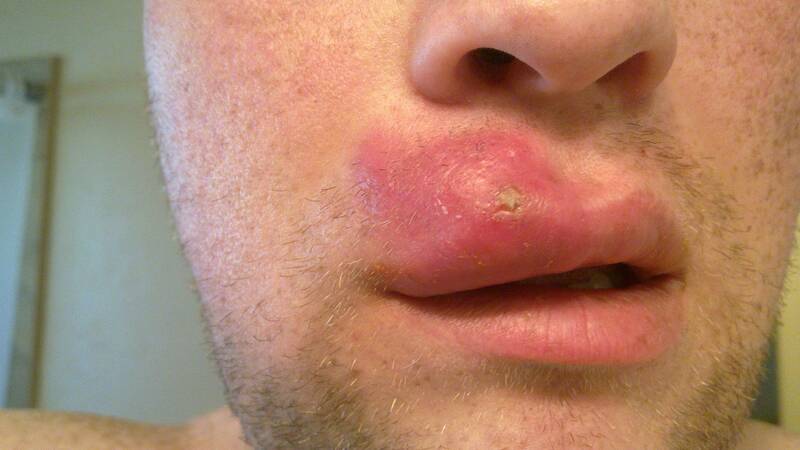 The truth is in many cases, the act of squeezing and picking at the matter blocking the pore, pushes it deeper inside, causing it to get inflamed and red and may even damage the tiny capillaries, leaving a permanent mark. Picking and squeezing with your fingertips or implement puts pressure on the inflamed pore resulting in a rupture and tearing of the skin. Especially in the case of those with cystic acne or pustules, the urge to get rid of the pimple is so strong we press and push until the entire blemish bursts – tearing the skin in the process. Not only that, chances are there will still be oil, bacteria, and debris trapped beneath the surface which will only worsen the condition. By end of this process of squeezing and expressing is over, the skin in torn and the area around the blemish is damaged. When pimples are picked and squeezed, and ruptured pores become inflamed or infected, they often leave a scab. That’s because the ‘injured’ cells send a message to the body to heal the damaged area, and when that happens, scabs form to protect the area. In most cases, the scabs are then picked off and this leads to permanent scarring. For those with darker skin tones (above Type III on the Fitzpatrick Scale), this can result in discoloration of the area which can be difficult to erase or fade. So while it’s almost impossible to leave that pimple alone and allow it to come to a head before gently popping it, it really is the best way to treat acne prone skin – especially if you want to avoid damaging the skin. When you squeeze a pimple with your fingertips, the downward pressure can spread the material through the skin, making a bad situation worse. If you simply must pop that pimple, then learn how to pop a pimple in the correct way. There are many different types of acne and a number of factors that cause it. The condition in which makeup is often blamed, is called acne cosmetica, a mild form of acne that present as small bumps on the skin. As the name implies, acne cosmetica is a form of acne triggered by the use of cosmetic products. However, this form of acne is not limited to the use of makeup alone. Products such as hair gel, hair spray, conditioner, shampoo, perfume and after shave can trigger acne cosmetica, and it can affect both males and females. The condition commonly appears on the cheeks and forehead where these products are usually applied and can take several weeks to appear. 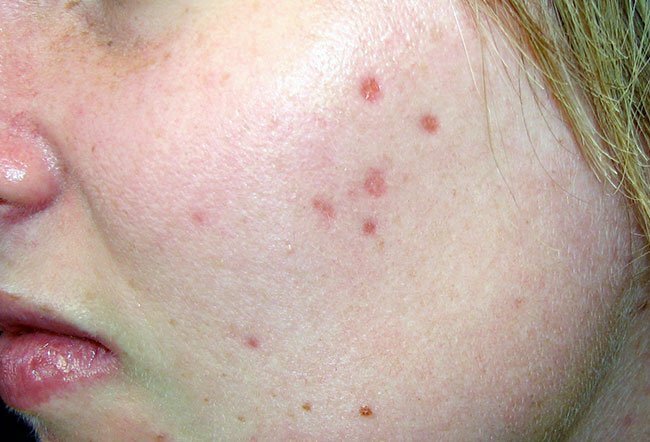 Usually the bumps are not inflamed or red like other forms of acne. So does makeup cause acne? Many believe that it is caused by pore-clogging (comedogenic) ingredients in cosmetic products and that the easiest way to avoid acne cosmetica is to use non-comedogenic skincare products. That is one way to help prevent acne cosmetica, however, there are other, more important factors to consider if your goal is to avoid, prevent, or reverse, acne cosmetica. Always remove all dirt, debris and oil residue so as to eliminate any chance of it accumulating and clogging the pores that can trigger a flare-up. Choose a cleanser that is suitable to your type of skin. If you have oily skin, select a cleanser that is formulated to control oil but does not dry your skin. However, a mild-antibacterial cleanser, used twice a day, is ideal for all skin types. Never sleep with makeup on your face – failing to remove all traces of makeup before going to sleep, practically ensures that you will develop clogged pores. Clean makeup brushes often. Dirty makeup brushes are loaded with bacteria and unless they are cleaned frequently they will exacerbate breakouts. Avoid using thick makeup to cover blemishes and imperfections – these only lead to even more breakouts. Rather, select a quality oil-free foundation or a mineral makeup product. Select products that are made with organic ingredients – these are safe and less likely to cause blocked pores or breakouts. Use a medicated cover-up under makeup or alone to help speed the healing process while covering blemishes. Hair products can find their way onto the skin throughout the day. If you are breaking out around the forehead or hairline, it could be your styling products causing the breakouts and irritation. Drink 8-12 glasses of water everyday to flush the toxins from your system. We all grew up believing in the wholesome goodness of milk – and there is no doubt, milk is a wholesome drink. But does drinking milk cause acne? It turns out that researchers have found a correlation between milk intake and acne. Their research reveals that milk drinkers develop more severe acne than non-milk drinkers. One study published in the Journal of the American Academy of Dermatology examined the diets of teenage boys and found that those who drank the most milk developed the worst cases of acne. The results of this study concurred with previous studies in which teenage girls were asked to monitor their diets and record acne breakouts. The findings revealed that girls who had diary-rich diets had more severe acne than those who limited their intake of dairy. In each of these studies, the kind of dairy was not limited to whole milk and products made with whole milk. In fact, skim-milk was the worst offender (so the milk-fat is not to blame).